It probably won’t surprise you to learn that at Traction® Tools, we’re big believers in having the right tool for the right job. Our name is built on it, after all! And when it comes to working remotely, the right tools are all the more important. Remote employees live and die by the technology they use, because it is those tools that enable remote work in the first place. It’s also easy to fall into shiny object syndrome—constantly snatching up the latest tool that makes any kind of promise about productivity. But if you’re always upgrading to another tool, your remote team will never find the balance of stability and efficiency within innovation. It’s just always disruption. So having the right tools for your remote team is essential for your company’s success. And that’s what Traction Tools is built on. Looking for better tech to maximize your productivity? Something you can stick with long term? Here’s a list of our favorite tools for remote teams. Use it as a starting point, but don’t adopt any tools that aren’t right for your company. Every team is different, because you’ll have your own needs, workflow, and company norms. Trello is a collaboration tool that organizes your projects into boards—kind of like a kanban board. In one glance, Trello tells you what’s being worked on, who’s doing what, and where something is in a process. You can easily reorganize your boards, add notes, change a status and add team members to tasks. There are tons of great options, from Dropbox to Box to Google Drive. We love Google Drive because it makes collaboration so easy. But the brand you choose isn’t as important as actually having centralized cloud-based file storage that your team can easily access. We’ve found Zoom to be the easiest and most dependable video conferencing tool around. Reliable conferencing software really is a non-negotiable for virtual teams. A glitchy meeting slows your team down, frustrates everyone, and makes your work more difficult to enjoy. Don’t settle for second-best when it comes to this! We use Slack to chat with each other in real time. Constantly. Throughout the day, every day. Chat conversations happen quicker than email—especially if a lot of back-and-forth is needed—and it’s often less disruptive to your workflow than a phone call. Slack also lets you customize your notification settings and your status so that you won’t be interrupted during an important meeting. And with emojis and Giphy integration, it’s easy to let your personality shine through! Collaboration is more than just getting work done—it’s also about connecting personally. Did you know that Google Calendar lets you give permission to share your calendar with the rest of your team? You can also create a team calendar and share it with your people. This makes it really simple to find ideal meeting times, without a bunch of back-and-forth through email. Another helpful scheduling tool is Doodle, which polls your team for their preferred meeting times. Sometimes things go sideways, or your team gets hit with a full plate of work. Whatever the case, everyone just needs a stress reliever. But it can be hard to decompress when you can’t gather as a team and take a breather together. That’s when a lighthearted YouTube video or Giphy image is just what the doctor ordered. Traction Tools makes it easier for remote participants to actively engage. Our popular built-in share screen allows everyone to actively participate—anyone can select priority issues to discuss, create To-Dos, and take notes on each Issue. Notes and To-Dos are centrally located and easy to access, so everyone benefits from the collaborative effort! Traction Tools is the first officially licensed provider of EOS software. Built on the Core Values of loving to help, optimizing and finding a way to win, we are dedicated to improving the efficiency and success of companies that run on EOS. 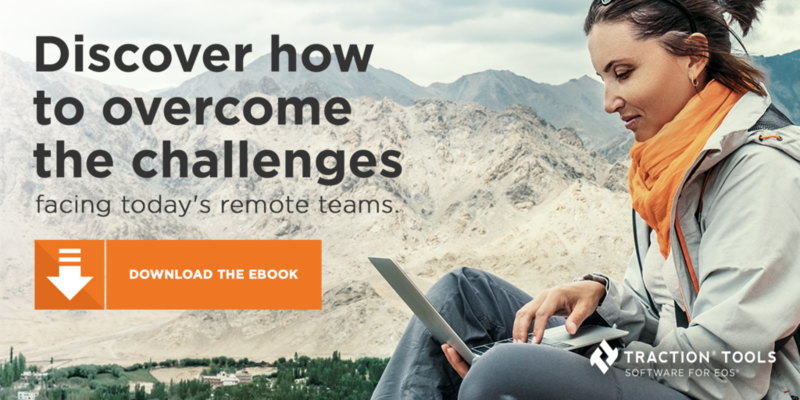 Discover how Traction Tools software can help increase your remote team’s collaboration and productivity—get an on-demand demo right now!